Claire has worked in the Care industry over 15 years and has achieved her Level 4 NVQ in Health & Social Care. She has a solid reputation in demanding the highest levels of personal care for our Residents and is also our in house trainer. Elm Lodge also employs a diverse mix of highly trained full and part time staff. Each understands the type and level of required needed by each of our Residents. To ensure we continue to maintain the highest level of care, all staff are enrolled on Level 3 or Level 2 NVQ (or equivalent) in Health & Social Care to ensure they have a good understanding of the service they are working in. All our Residents are allocated a member of our Care Team as a Key worker who will get to know them just that bit more in order to provide tailored personal care. At any given period of the day or night, Elm Lodge does have what is termed a 'Designated Responsible Person' and he/she is in charge of Elm Lodge at that moment of time. To become a part of our Team go to the Careers section. We provide Residential Care and Day Care. 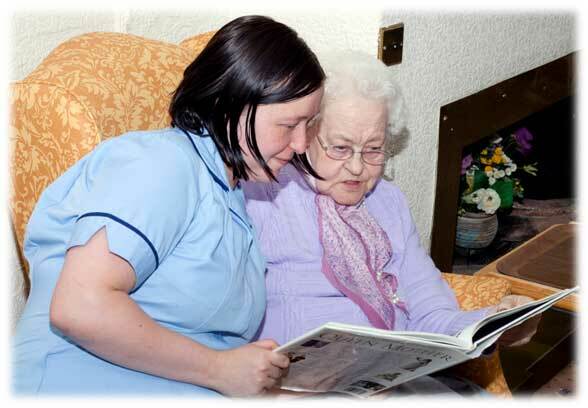 To be the best care home in the region by providing a home -to - home within a safe and caring environment.